Hello, and thank you for investing time. 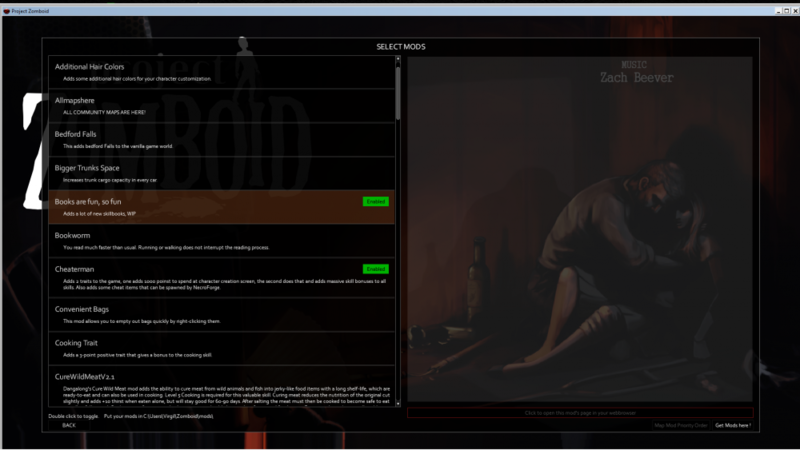 I decided as a highly intelligent entity to bless the community of Project Zomboid with a mod that adds skillbooks for each and every skill, but sadly in my library there are no such things as computers, therefore I have no background in coding. All inserted down into the scripts folder from the media one. But here I am into my game, mod is loaded, palms are sweaty. Harms are heavy, no spaghetti, dou, because none of my books seem to spawn. I tried loading them manually via Necroforge but no use, as they dont appear there either. Care to help a fellow member of the community? Have you enabled your mod in the `Mods` section? Could you please post your mod.info file? Yes I did enable it, as you can see in the pic. description=Who said reading cant be fun? 1) your scripts .txt entries look mostly fine. What your missing though is "NumberOfPages"
NumberOfPages is generally 220 for book 1, 260 for book 2, 300 for book 3, 340 for book 4, and 380 for book 5. Your distribution code seems fine, it could be just the random generator screwing with you. Make sure your lua code for the distributions are in media\lua\server. The vanilla file that performs this is media\lua\server\XpSystem\XPSystem_SkillBook.lua (the code above uses a slightly different syntax then the vanilla, but the effect is the same). if NecroList then -- necroforge is loaded. Your books will now appear under necroforge's 'Mods' category (on the right side, not under Literature on the left). You can add any additional books or items into the MyItems table near the start of that code. It also generally helps to check the console.txt file after loading the mod, and after entering the game world to see if any errors has occurred. EDIT: just relooked at your script .txt paste, you have a error in there, the word "Base" that occurs before your first item entry. This will stop your books from being added to the game correctly, which would be why they never spawn.